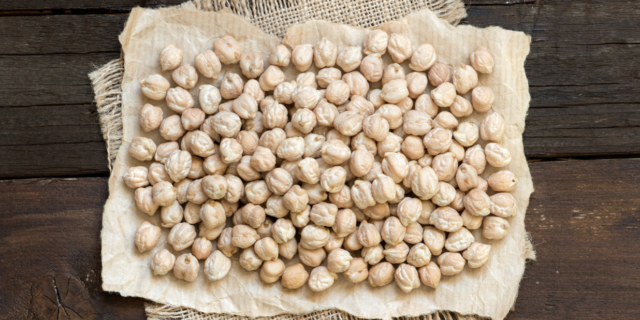 Chickpeas, which are also known as garbanzo beans, hold the title of being one of the oldest foods in the world. They remain popular in every continent and are renowned for their nutritional benefits. These small, round legumes belong to the pea family and can be technically considered to be a seed pod. They help boost the digestion, make you feel full, stabilize blood sugar levels, provide protection against heart disease and much more. Chickpeas are full of vitamins, minerals and protein and are a large part of both the Mediterranean and the Ayurvedic diet. They are a good source of fiber, protein, manganese, B vitamins, iron, potassium, zinc and more. Best of all, chickpeas make you feel full even though they are low in calories. When you consume chickpeas you’ll be able to curb your food cravings and will tend to snack less on unhealthy foods. These peas help to regulate the blood sugar levels in the body and help to maintain a high energy level. They provide an excellent feeling of satiety especially when they are paired with other whole foods that are high in nutrition. Legumes naturally provide an alkalizing effect for the body and help to balance the pH levels. They are a great diet addition for anyone that is trying to control the level of acidity in their bodies. As well, since they are high in protein, they are perfect for vegetarians or vegans that follow a strict diet. Chickpeas have less earthiness and bitterness to them than other legumes so they are more versatile for cooking. The flavour is quite mild and nutty and they can be easily mashed as an ingredient for dips, batters and spreads. If you’re running a restaurant or another dining establishment and need large quantities of chickpeas, please visit our website at Epigrain.com. We also offer a variety of other gourmet ingredients that can be ordered along with the chickpeas. Epigrain is where to buy wholesale organic grains in bulk.